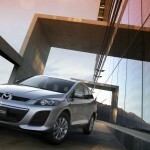 Japanese manufacturer Mazda will reveal at the Auto Show in Toronto Facelift version of the SUV CX-7. For the 2010 CX-7 will receive a number of aesthetic improvements, and a new gasoline engine of 2.5 liters. 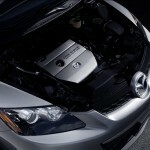 The standard version new engines will develop 161 horsepower at 6000 rpm and 218 Nm at 3500 rpm. Regarding the 2.3 Turbo engine, it has remained unchanged and continued to develop 244 horsepower at 5000 rpm and 350 Nm at 2500. In terms of design, Mazda CX-7 Facelift received a number of changes to both exterior and interior. On the outside, the front and the rear have been revised while the interior materials find a quality, redrawn watches, but also a new display.